What Can a Little Girl Wear That's Upscale Casual? The classic pompadour requires little more than pomade, a comb and a good barber. 3 What Can a Little Girl Wear That's Upscale Casual? While you can go all out, wearing '50s vintage from head to toe, creating a rockabilly look doesn't have to require that degree of investment or effort. You can assemble a retro look from your own closet, local shops or even the thrift store down the street. Whether you need a one-time outfit or are building a new rockabilly wardrobe, these looks will take you from everyday errands to an unforgettable show. From cool cats to bodacious Betties, perfect your rockabilly style for day and night. Choose a clean and clear color palette to give even the simplest outfits a retro, rockabilly flair. Black, white and red are traditional choices, bringing to mind the classic 1950s diner; however, other shades are equally at home at a car show or on the dance floor, including turquoise, emerald and navy. Pastel shades were popular then and are a lighter alternative to typical rockabilly brights for both guys and girls, particularly in the spring and summer. For girls, create a rockabilly style for every day by pairing fitted capri pants or ankle-length, slim-cut trousers with a cotton blouse, preferably in gingham or polka dots. Roll your sleeves and tie the tails just above your waist, if the weather allows. For a more polished everyday style, replace the pants with a cotton-print circle skirt and solid color, fitted top in a fine gauge knit or woven fabric. Finish your look with a fitted cardigan in a solid color and ballet flats or classic, flat canvas sneakers. Casual wear for guys requires little more than straight-leg jeans, rolled at the hem, a classic tee, and a denim or leather jacket. Basic engineer boots are a practical, go-anywhere choice. For a dressed-up retro style, look to the classic fashions of the 1950s. Rockabilly dames can opt for dresses with fitted bodices, nipped-in waistlines and full skirts, worn over crinolines or snug-fitting wiggle dress styles to show off their curves. Skip the everyday cottons in favor of higher-sheen satin, taffeta, lace and chiffon. Embellished western shirts are a favorite for the guys, but a 1950s vintage suit with baggy pants, narrow lapels and a skinny tie is suitable for fully formal occasions. No rockabilly look is finished without the styling, including the hair and accessories. Girls should always wear curls, whether short or long, with shades of bright red, platinum or black being the most popular hair colors. For every day, long locks can be styled into a perky high ponytail or worn loose, but vintage-style victory rolls are ideal for evening. Wear shorter styles set into curls during the day or dressed up with sparkling rhinestones for evening. Opt for a structured vintage-style bag during the day and a shimmering clutch for evening. Daytime jewelry and accessories can be whimsical, featuring prints in cherries and skulls. 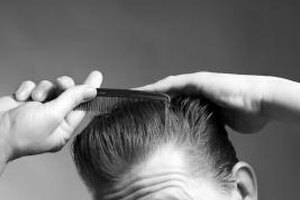 Guys should rely on a traditional pomade, rather than modern gel, to style hair into a pompadour or a simpler slicked-back 'do. Polish shoes or boots to a high shine and indulge in over-the-top belt buckles to finish off a rockabilly style. What Do You Wear at a White-Tie Gala?